I’ve been obsessed with bright colored accessories this spring, and when I saw Who What Wear and P.S. 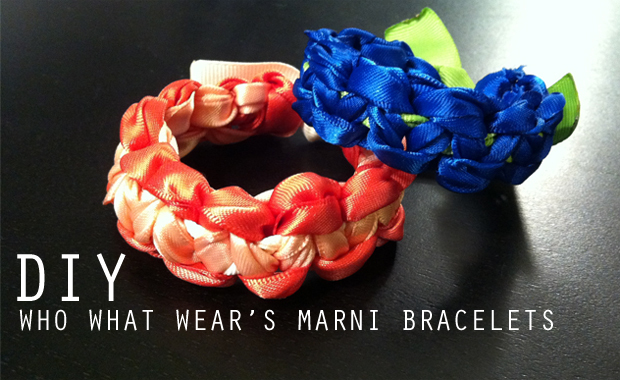 – I Made This‘s DIY braided Marni bracelets all I could think about is how to get myself to my nearest craft store. Alas, it was a few weeks before I made it to a Michael’s but I finally did today and am happy to report that the bracelets are super easy and fun to make! I wasn’t exactly sure how I’d be using the ribbon when I bought it but now that I know I’m thinking about trying the bracelets again with slits of fabric or rope. I also have two more DIY jewelry projects I’m looking to try — a braided hex nut bracelet and a woven chain bracelet. I haven’t been able to find a curb link bracelet in the right size for my wrists (they are tiny) but if I ever do you know what I’ll be spending my weekend doing! Have you tried any DIY projects recently?